Analysis The story is that the world is heating up - fast. Prominent people at NASA warn us that unless we change our carbon producing ways, civilisation as we know it will come to an end. At the same time, there are new scientific studies showing that the earth is in a 20 year long cooling period. Which view is correct? Temperature data should be simple enough to record and analyze. We all know how to read a thermometer - it is not rocket science. Previously we looked at how US temperature data sets have been adjusted - with more recent versions of historical data sets showing a steeper rise in temperature than they used to. Here, we'll be looking at current NASA data and why their temperature maps appear hot-red, even when others are cool-blue. To recap the earlier article, the graph below shows additional adjustments to the data set since the big "correction" in 2000. We observe that the data has been consistently adjusted towards a bias of greater warming. 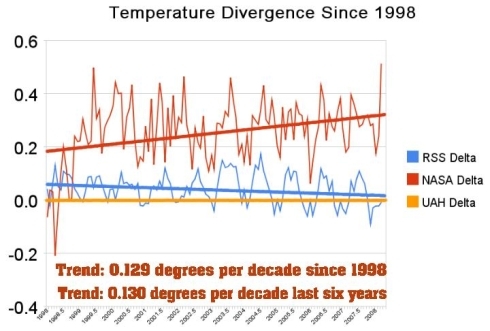 The years prior to the 1970s have again been adjusted to lower temperatures, and recent years have been adjusted towards higher temperatures. 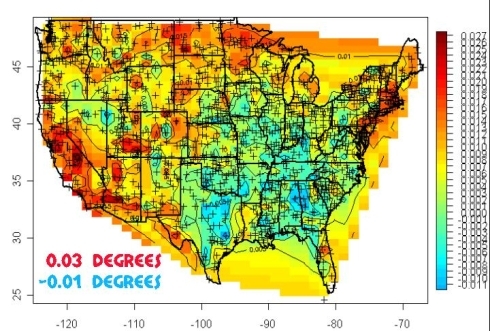 NASA's published data is largely based on data from the US Historical Climatology Network (USHCN), which derives its data from thermometer readings across the country. According to USHCN literature, the raw temperature data is adjusted to compensate for geographical movements in the weather stations, changes in the 24-hour start/end times when the readings are taken, and other factors. USHCN is directly affiliated with the Oak Ridge National Laboratories' Carbon Dioxide Information Analysis Center, an organisation which exists primarily to promote the idea of a link between CO2 and climate. The map below shows what the raw unadjusted USHCN temperature trends for the US in the 20th century looked like. Prior to any adjustments, more than half the US shows declining temperatures over the 20th century - blue and green colors - i.e. the US is cooling down. However, subsequent to the adjustments the country goes dominantly warmer (red and yellow) - as seen in the image below. Below is a video showing the USHCN adjustments in action. 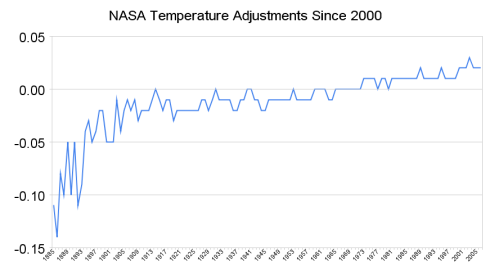 So how does NASA's data compare with other temperature sources? As we explained in our earlier article, NASA data is derived from a grid of ground-based thermometers. During the last thirty years, we also have the benefit of more sophisticated technology - satellites which can indirectly record temperatures across most of the planet. The satellite data is from Remote Sensing Systems (RSS) and the University of Alabama at Huntsville (UAH). Differences between reported temperature anomalies, NASA, RSS and UAH - with UAH as the baseline. The divergence is now quite striking. Looking closer at March 2008, NASA's data shows the month as the third warmest on record. In sharp contrast, UAH and RSS satellite data showed March as the second coldest on record in the southern hemisphere, and just barely above average for the whole planet. How could such a large discrepancy occur? Hands up who isn't p! *$ed off about Amazon's new HQ in New York and Virginia? Analysis Ok, we have Amazon. Anyone else?